Trump’s approval ratings are in the toilet compared to any other modern president at this stage of his presidency. At least some of that public disapproval comes from his repeated attempts to issue overly broad or discriminatory or otherwise unconstitutional executive orders. These were promptly blocked by federal courts, although Trump could yet prevail at the Supreme Court. It turns out that these disastrous EO’s haven’t been The Tangerine One’s ideas at all. He’s just taking marching orders from President Bannon’s whiteboard checklist. Let us underline that: Trump’s agenda is Breitbart, alt-Neo-Nazi agenda. 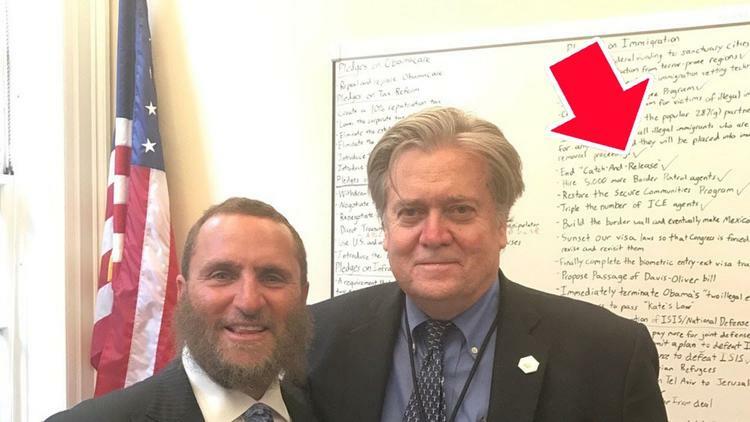 Alt-White-Supremacist Steve Bannon tried to do a whitewash of his smelly politics by taking a selfie with Rabbi Shmuly Boteach, but instead Bannon got whiteboarded – his neo-Fascist to-do list showed up in the background. You know how in movies about paranoid conspiracy theorists they always show the guy with a bunch of wild items pinned all over his walls? Our country is being run by one of those. According to WaPo and LA Times, these are the items on Bannon-‘s to-do list. For his failed policies I have quoted past Informed Comment articles explaining. Derrick Watson, US District Court judge in Honolulu, has issued a nationwide Temporary Restraining Order against Trump’s second attempt at an Executive Order excluding people from Muslim-majority countries from the United States. Watson found that the state of Hawaii, which brought the suit, was likely to prevail in its complaint that the president’s order would impose irreparable harm on the University of Hawaii and on the state’s tourism industry. He also found that it violates the constitutional rights of American Muslims. (I made the same argument soon after it was released). The immigration bill, proposed by then Sen. Jeff Sessions in 2015, is named for two California police officers who were killed by immigrants living in the U.S. illegally. If Trump tries to push this Mussolini type agenda on the United States of America, I predict that his presidency will sink even faster.